All I have to say is... "Dear god, why?" It's Pop Vinyls. They're going to make a vinyl of everything. Ice Slasher variant is the only good variant. Hey Capcom! 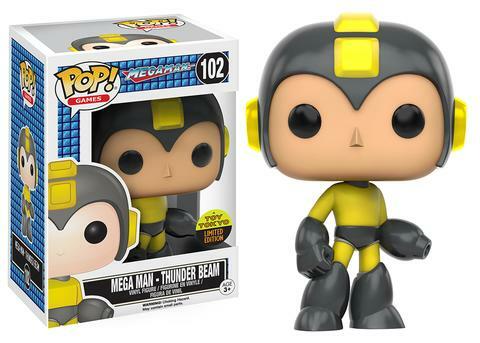 You know that you would sell way more of these if they were bundled with a new Mega Man game, right? Mega Man Pop Vinyl the toy = Mega Man 11 the game. Great! Another STUPID pop thingy. I swear I see no point to them as you literally can't do nothing with them, they just take up space! Even worse when theyre kept in box! Now that's a face only a mother could love. I hate POP vinyl figures - they're ugly and don't do anything. I guess this is why some people are similarly frustrated when popular characters get Lego minifigures, but they at least use a visually appealing style and have a couple points of articulation. The only appeal to these things are that they're around a quarter of the price of the 4Inch-Nels, Figmas, and Nendroids. Talking about LEGO, why CAPCOM never created a Mega Man-based LEGO toyline? Make it happen kipkooom! Ick, I guess that's one more for those who DO want him. Dr. Wily and Protoman were their only saving grace in this line, and I'm not too fond of them either! To each his own - I love these lil things. I think they look pretty neat when you have a collection nice and organized. Ain't no different than collecting statues, or other action figures. "They don't do anything but take up space..."
No s--t, stupid - it's called collecting. uhhh yeah, it's called collecting. there are a lot of figures out there that people collect that don't do anything but take up space. It's just a fun hobby. Hopefully Toy Tokyo put this on their website, because I'm not paying scalper price for this guy. I'm keeping my fingers crossed for Roll + Dr. Light in the next wave. Are you still giving away one of these POPS?